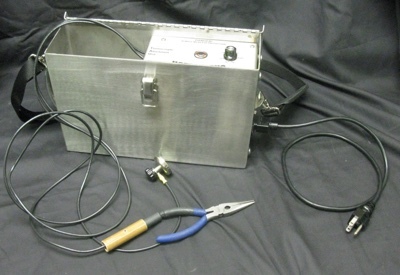 Manufactured by Hotfoil-EHS, the EHS-TAU (thermocouple attachement unit) has a durable stainless steel case with hinged lid and clasp. All components are all attached to a removable bracket held in place by 4 - 1/4" screws through the side. 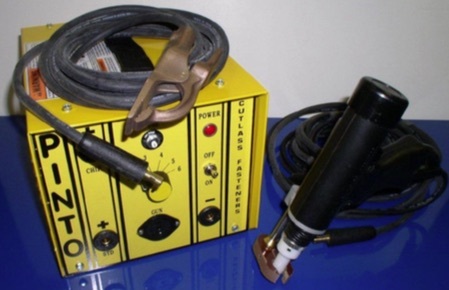 The EHS-TAU comes complete with pliers, magnet and a charge cord. 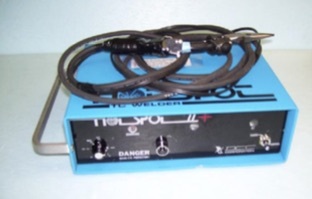 EHS Hot-Spot II Thermocouple Attachment Unit. The unit has a light, ready light, charge button & a discharge button. It comes equipped with pliers, magnet, charging cord & SS case. 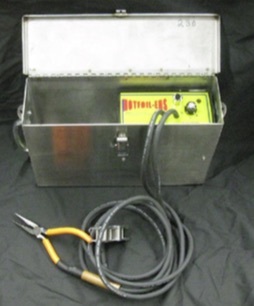 PIN WELDING 12ga.-10ga.& 14 ga. insulation pins, bantam weld gun and cable set 16ft. long, 120 volt supply input, 10 amp circuit breaker protected, simple 1-6 power settings, only 28 pounds, powder coated finish. 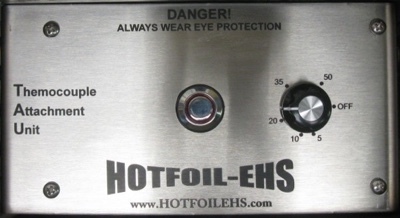 Hotfoil carries all replacement parts, accessories, collets, collet protectors, stops, and inserts.